He was the first member of cabinet to travel to Canada. Gen. John Kelly poses for a photo with Public Safety Minister Ralph Goodale on Parliament Hill in Ottawa on March 10, 2017. 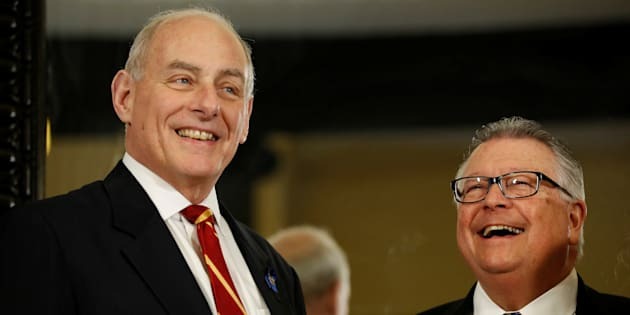 OTTAWA — Gen. John Kelly's appointment as U.S. President Donald Trump's new White House chief of staff was greeted warmly Monday by the Trudeau government, which believes it has built a strong relationship with the former Homeland Security secretary. Kelly, a retired general who was described as "an adult in the room," "well-informed," and "responsible," by Canadians who've worked with him, signalled discipline was coming to the White House as controversial, foul-mouthed communications director Anthony Scaramucci was let go. Press Secretary Sarah Huckabee Sanders told reporters that all staff, including Trump's daughter, Ivanka, and son-in-law, Jared Kushner, would now report to Kelly. "Gen. Kelly has the full authority to operate within the White House," she said. Scaramucci, whose appointment 10 days earlier had caused press secretary Sean Spicer to quit, unleashed a foul-mouthed tirade against then chief of staff Reince Priebus and Trump strategist Steve Bannon that Huckabee Sanders said the president frowned upon. During a morning meeting in the Oval Office, Trump said Kelly, who had just been sworn in to the new role, would do a "spectacular job" leading his staff. The president praised him for getting "tremendous results" on border issues with Mexico, with "very little controversy." "I predict that General Kelly will go down as, in terms of the position of chief of staff, one of the greatest ever," Trump later added as his cabinet gathered. "We're going to have a good time. More important, we're going to work hard. We're going to make America great again." In Ottawa, Kelly's appointment is seen as a positive sign. He is one of the individuals with whom the Trudeau team has built the deepest links. So far, in six months, Kelly has spoken and met with Canadian cabinet ministers more than 20 times. The first face-to-face occurred in Washington, D.C., in February, when Prime Minister Justin Trudeau and several cabinet ministers visited the Trump administration. In March, Kelly was the first member of Trump's cabinet to travel to Canada. He met with the Canada-U.S. cabinet committee and held bilateral meetings with Public Safety Minister Ralph Goodale, Transport Minister Marc Garneau, Foreign Affairs Minister Chrystia Freeland and Immigration Minister Ahmed Hussen. U.S. President Donald Trump sits after John Kelly was sworn in as White House Chief of Staff in the Oval Office of the White House in Washington, D.C. on Monday. According to a joint press release, they discussed shared border security, traveler screening, cross-border trade, law enforcement co-operation, infrastructure, and immigration policy. During the visit, Goodale took Kelly on a tour of Parliament Hill, stopping by the Memorial Chamber in the Peace Tower, where Canada's fallen are commemorated. Kelly's son, Robert, was killed in Afghanistan in 2010 after stepping on a landmine. "The minister has spoken a few times about the frequency with which the two speak and the candour and co-operation that is the hallmark of most of the discussions," Dan Brien, Goodale's director of communications, told HuffPost Canada. "I say 'most' because I haven't sat in on all of their discussions," he added, with a smile. Kelly and Goodale enjoyed an open line of communication, Brien added, noting that Kelly called occasionally unexpectedly. "It's not a bad thing" to have Kelly in the White House, Brien added. "That understanding, that history of conversation, and meetings and understanding of cross-border issues, all of a sudden you know that is going to reside in the White House." Gen. John Kelly poses with Canada's Innovation, Science and Economic Development Minister Navdeep Bains, Public Safety Minister Ralph Goodale, Foreign Minister Chrystia Freeland and Defence Minister Harjit Sajjan on Parliament Hill in Ottawa on March 10, 2017. Lots of attention has been given to Ottawa's extensive outreach to Americans within the Trump administration, but also at the state and local levels. Trudeau's team suggested Monday that Kelly's appointment shows that their strategy works. MaryScott Greenwood, the CEO of the Canadian American Business Council, met Kelly at the Halifax International Security Forum last year and describes him as a straight shooter who will tell the president what he thinks. Like many of senior members of the U.S. military, Kelly has a unique appreciation of the Canada-U.S. relationship based on military security co-operation, she said. "The Trudeau government already has good relationships with lots of players in the Trump White House, and John Kelly, in his new capacity, will absolutely be part of that, so I think it will be seamless from the point of view of the government of Canada," she said. Trudeau's chief of staff, Katie Telford, has a good relationship with Kushner and Trudeau's principal secretary, Gerald Butts, gets along well with Bannon. While few officials were willing to comment on-the-record about White House staffing changes, Greenwood referred to the change as a "lucky bounce" for Canada. "That is not to say anything negative about Reince Priebus.... it's just a bounce for Canada." "Kelly is one of the secretaries who is the most respected, so I think that he might bring some mature adult supervision," a government source told HuffPost. "I think it cannot hurt the administration. And it's not a new person that is coming in, it is someone that government members have met, who has come to Canada, who knows files, who is not starting from scratch, but who has knowledge and interpersonal relationships with Canadian cabinet ministers. It is extremely positive." In the Prime Minister's Office, where Trudeau's team has devoted a significant amount of resources to managing the Canada-U.S. relationship with an eye at the upcoming NAFTA negotiations, the impact of strong interpersonal connections between Kelly and Canadian ministers is noted proudly. Canada was the first country to obtain an "exemption" for its nationals following Trump's first iteration of a so-called "Muslim ban," another official noted. The Canadian government was worried that Canadians with dual citizenship to one of the countries affected would be barred from entering the United States. There were also concerns that permanent residents with ties to those affected countries would not be able to cross the border. Kelly was the one of the key individuals whom officials reached out to receive assurances that Canadians would not be affected. "Our approach has been to work with everybody, [but] there is no question that our strong relationship with Gen. Kelly personally is going to continue to be helpful," that senior official noted. Newly sworn-in White House Chief of Staff John Kelly is shown at the White House in Washington, D.C., on Monday. Kelly has also been helpful in aiding the Trudeau government understand where the influx of asylum crossers who snuck into Canada this past winter obtained their U.S. visas. This spring, Kelly also placed a call to Garneau to inform him the Trump Administration might expand a laptop ban on all flights into and out of the United States. "Kelly is someone my boss respects a lot," said a staff member in Garneau's office, who wasn't authorized to speak publicly. "My boss found him really solid and liked to deal with him," he added. "He's really top-notch." After his Ottawa meetings, Kelly said he'd "like to see the northern border to be even thinner." In front of a Senate Homeland Security committee, he praised Canada as having "tremendous law enforcement,'' and he disputed suggestions the Canada-U.S. border needed beefing up. "The absolutely great news story in the northern border is that we have Canada there, that it's a friend and ally. They interact with us at every level, they're very careful about who comes into their country," he said. Kelly returned to Ottawa with U.S. Attorney General Jeff Sessions in June to take part in a meeting of the Five Eyes, the intelligence alliance composed of Canada, the United States, Britain, Australia, and New Zealand. Transport Secretary Elaine Chao has been to Canada twice, according to federal officials. Steven Mnuchin, the secretary of the Treasury, has been to Ottawa once.